The extraordinary encounter saw the leader of the world's most powerful democracy shake hands with the third generation scion of a ruling dynasty, standing as equals in front of their nations' flags. 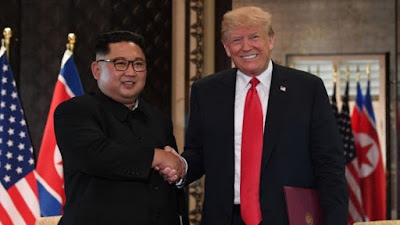 Kim agreed to the "complete denuclearisation of the Korean Peninsula", a stock phrase favoured by Pyongyang that fell short of long-standing US demands for North Korea to give up its atomic arsenal. After a day filled with smiles and compliments in the sumptuous setting of a luxury Singapore hotel that was watched around the world, the US "committed to provide security guarantees" to North Korea. Asked about denuclearisation -- the crux of the summit -- Trump said, "we're starting that process", adding that it would begin "very, very quickly." But the text of the two men's agreement made no mention of previous US demands for "complete, verifiable and irreversible denuclearisation" -- jargon for scrapping weapons and committing to inspections. In neutral Singapore, the leaders, who had previously hurled insults like "mentally deranged" and "little rocket man", showered compliments on each other. Trump said he had formed a "special bond" with Kim, whose regime has been accused of multiple human rights abuse and who is suspected of ordering the assassination of his brother at a Malaysian airport last year. "We'll meet again," Trump said after a signing ceremony, standing with Kim on the verandah where they first met. "We will meet many times." Trump said he "absolutely" would be willing to invite Kim to the White House. For his part, Kim said the two Cold War foes had vowed to "leave the past behind", pledging "the world will see a major change." The extraordinary summit -- unthinkable only months ago -- comes after the Washington and Pyongyang appeared on the verge of conflict late last year as the leaders slung personal insults and Kim conducted nuclear and missile tests. "It's a huge win for Kim Jong-un, who now —- if nothing else -— has the prestige and propaganda coup of meeting one-on-one with the president, while armed with a nuclear deterrent," said Michael Kovrig, Crisis Group Senior Adviser for North East Asia. The warm words and positive optics seemed a different era from when Trump was threatening to rain down "fire and fury" on Pyongyang and Kim attacked Trump as a "mentally deranged US dotard", as he fired off a series of provocative weapons tests.